Damaged leather lounges, chairs and sofas, whether torn, worn, ripped, faded, is chewed by a dog, or scratched by a cat, can be restored by Fibrenew. Blemishes on furniture such as burns, stains, holes and cuts can also be renewed. 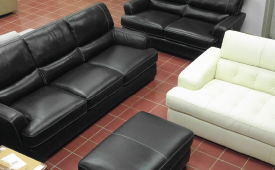 If you’re looking to change the color of your leather furniture, turn to our expert color matching and re-dye services. We offer mobile service leather repair to your home.